The circuit on the outskirts of Shanghai has been a happy hunting ground for Lewis Hamilton. He has won the Chinese Grand Prix five times. He made the first move to win number six by setting the fastest lap time in the opening practice session for the weekend. 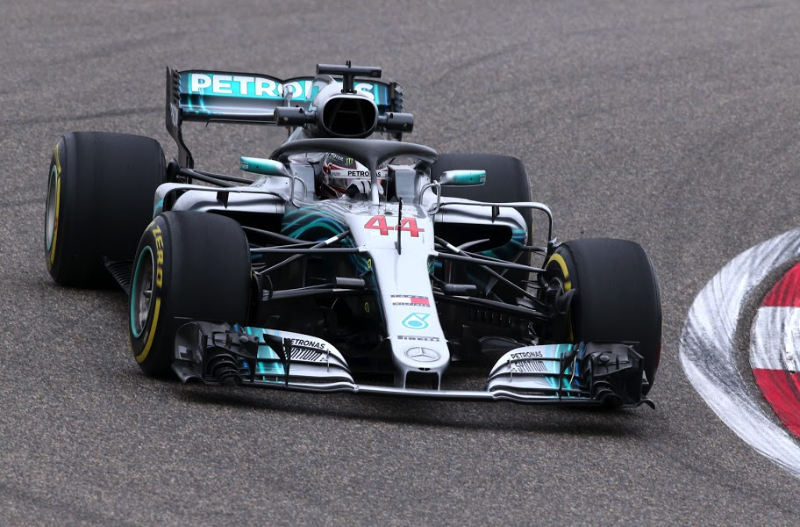 The line-up was: Mercedes – Lewis Hamilton and Valtteri Bottas; Ferrari – Sebastian Vettel and Kimi Raikkonen; Red Bull TAG Heuer – Daniel Ricciardo and Max Verstappen; Force India Mercedes – Sergio Perez and Esteban Ocon; Williams Mercedes –Lance Stroll and Sergey Sirotkin; Renault – Nico Hulkenberg and Carlos Sainz; Toro Rosso Honda – Brendon Hartley and Pierre Gasly; Haas Ferrari – Romain Grosjean and Kevin Magnussen; McLaren Renault – Fernando Alonso and Stoffel Vandoorne; Sauber Ferrari – Marcus Ericsson and Charles Leclerc. This would be Hartley's first outing on the 3.387-mile (5.451-km) 16-turn track in a F1 car, but he knows the track well. "I have driven at the Chinese track a few times in the World Endurance Championship," he said, "and we had quite a bit of success there in LMP1, with two wins and a second place and that's always good for your confidence. "I quite like the track; it's very technical and very hard on tires with such a long Turn 1 - where I think there's 10 different options and lines, and there's always some crazy passes on the inside, which is good for the driver and fun for the fans. Also entering the back straight, there's a really long right hander which is really hard on the front left tire, so I think tire management will be a bit of a discussion in China. "Shanghai itself is a great city, very international, with a unique Chinese flavor, but seeing the sights will have to wait, as it's going to be a very busy week, following on immediately after Bahrain." The ambient temperature at the start of the 90-minute session was 64 degrees Fahrenheit (18 degrees Centigrade) and the track temperature was 66 degrees Fahrenheit (19 degrees Centigrade). There was a threat of rain so the drivers were anxious to get going. Pirelli's dry weather tire compounds for the weekend were: medium, soft and ultra soft. "Night and day better compared to last week - loud and clear," the team radioed to him on track. There was the usual lull in track action after the drivers did their install laps and pitted. The Merc crew changed the rear wing on Hamilton's car. It was a gusty, windy day out there, and there was a strong tailwind into Turn 6. "I can feel it, especially in braking," Vettel said. Alonso set the first serious time – a 1:38.765. Then Raikkonen brought that down to a 1:37.651. As more drivers got up to speed, Hamilton made the prime time a 1:35.218 and then a 1:34.962 on the soft tires. At the 40-minute break the top 10 were: Hamilton, Bottas, Ricciardo, Verstappen, Vettel, Raikkonen, Ocon, Grosjean, Sainz and Magnussen. Back on track, Hamilton, still on the soft compound, lowered his time to a 1:33.999. Verstappen, meanwhile, took a trip into the gravel trap in the final turn. Not to be outdone, Hamilton had a quick spin at Turn 11. Raikkonen donned some ultra softs and turned a 1:34.475 to move into third, followed by a 1:34.358 to take second place. Next, Vandoorne took a wild ride at Turn 10. He pitted so the mechanics could check the car over. Hamilton remained as the head of his happy hunting ground as the session wound down. Raikkonen, Bottas, Ricciardo, Verstappen, Vettel, Magnussen, Sainz, Grosjean and Hulkenberg rounded out the top 10 in FP1.